Security has never been more important than it is today. From fire and temperature alarms through to access control systems and CCTV, there is now a range of technology that can help protect you, your family and business. At BGUARDED, we have the knowledge and expertise to recommend the right security and protection systems for you, built to secure you and your belongings and protect the way you want to live or work. Alarm Systems – from simple intruder alarms through to full sensor systems, BGUARDED can build a system around your specific needs. Additionally we can offer you maintenance and emergency call out services to make sure your alarms work effectively. Electrical Installations – we are able to provide you with any supporting electrical wiring work for your new security installations. We are available for repair work and can discuss voltage optimisation to reduce your electricity bills. Access Control – do you wish to limit access to specific areas in your property or premises? With a whole range of devices available, we can design an access control system that fits to your needs to allow authorised people to enter your property. CCTV – capture live and recorded images of activity on your site or in your building. Acting as both a deterrent and a useful record of any accidents or criminal behaviour, this type of protection is essential in today’s modern world. At BGUARDED we will help you discover the pathway to a fully integrated security solution, giving you unprecedented levels of protection. Combine CCTV, access control and alarms to create a bespoke system that fits you, your family and protects your way of life. 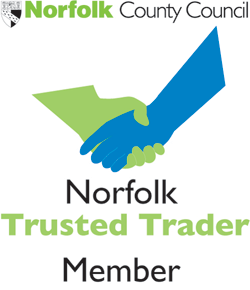 BGUARDED is a member of Norfolk’s Trusted Trader scheme, giving you confidence on the quality of our workmanship and commitment to customer satisfaction. We are proud to work as preferred partners with many of our suppliers such as Aico, Jablatron, Texicom and Qvis. We keep up to date with equipment installation by taking specialist training on their recommended products.